Sell you home quicker and for more money by offering a 1 Year HomeLife Home Warranty, regardless of the age of your home! 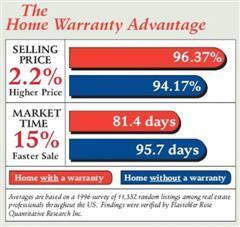 Warranty provides low cost peace of mind during the hpme buying and selling process. UNIRISC protects you from the high cost of repair due to unexpected breakdown of covered home systems and appliances arising from normal wear and tear. Most home buyers use all of their available cash and credit to purchase a home. What if a major appliance, water heater or furnace malfunctions or stops operating altogether? Who would you call? How will you afford the costs of repair? 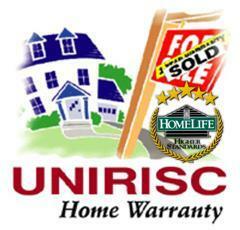 The UNIRISC Home Warranty eliminates those worries and lets you enjoy your new home with the comfort of knowing that you and your major home systems are protected. A home warranty is an important selling tool for anyone who is selling a home. By having a home warranty on your listed home, you are showing prospective buyers that you are backing up what your are selling. Not only do homes with a home warranty tend to sell faster and closer to the asking price, but a home warranty also protects the Seller from possible "after the sale" disputes. your home sells and closes. The HomeLife™ Home Warranty Program is a powerful tool that protects the buyer/seller from post-closing situations in the event of appliance, electrical, plumbing, or other malfunction. This program gives you an advantage over other property listings by giving you confidence in your decision to purchase a home through a HomeLife™ Brokerage. The Home Warranty Program as well reduces the chance of a delayed closing and can help avoid conflicts over a malfunctioning item that could affect or delay a sale. Giving you “A piece of mind” transaction whether buying or selling your property. Ask one of our HomeLife Sales Representatives for full details on the program and coverage. Q1. Why is the HomeLife Home Warranty important ? A1. Neither the Seller, Buyer nor the Real Estate Broker / Sales Representative can predict the serviceability or life of pre-owned equipment during a Real Estate transaction, HomeLife Home Warranty protects all parties from any future potential dispute. Buyer will definitely feels more comfortable / protected buying a pre-owned home with the Warranty, Seller also gain a powerful merchandising tool in selling their property. Q2. What is the HomeLife Home Warranty Program ? A2. A ONE full year service agreement, administrated by Unirisc, covering the cost of repair / replacement of most of the major equipment and system within the home in the event of mechanical failure, subject to a deductible per trade call. Q3. Is HomeLife Home Warranty the same as Homeowner’s Insurance ? A3. NO, homeowner’s insurance normally covers only damages caused by Acts of God or outside perils such as fire, water, lightning, etc. as well as consequential damage. HomeLife Home Warranty provides for repair / replacement in case of mechanical breakdowns or malfunctions due to normal wear and tear. Q.4 What types of properties are eligible for HomeLife Home Warranty Coverage ? A.4 It covers single family, owner-occupied, residential homes at the time of resale, including owner occupied Condominium / Townhouses. Rental properties can be covered with prior approval by Unirisc. Commercial /Industrial buildings or vacant properties will NOT be covered under this program. Q.5 What is the period of coverage ? A.5 One full year ( 12 months ) from the date of closing . Q.6 Are there any age restrictions for coverage of the equipment ? A.6 No, however, there is a limited coverage for the heating system, water heater, air conditioning system and appliances in excess of 12 years of age. Q.7 What happens when a mechanical failure of a covered equipment or system occurs? A.7 All requests for service must be made by calling UNIRISC at 1-800-267-1222. After verifying the service agreement, Unirisc will help to arrange for a qualified local service contractor to check out the problem and will give instructions for getting proper approval for the repair work. All work will be performed as quickly as possible. Q.8 Can this Warranty be renewed after 12 months period ? A.8 Coverage can be renewed at the option of Unirisc. In such case, policy holders will be notified at least 30 Days prior to the expiration of their existing agreement. There are 3 available programs available. With C$ 50 deductible per service call. ** Check for details of coverage and exclusion. Central air-conditioning and appliances : Refrigerator / Range / Range Hood / Washer / Dryer ( gas/electric) / Central Vacuum / Garbage disposal / Built-in Micro Wave Oven / Built-in Dishwasher / Built-in Trash Compactor. Appliances described in Platinum Warranty + equipment within the INTERIOR of the Condo Unit only. *** check for details of coverage and exclusion.